Samples of Taylor Creative Video Work can be found on . Click here to get to the Taylor Creative channel. We've done lots of video work...and the subject matter runs the gamut. Video can be expensive, but it tells powerful stories in engaging ways. Our promise is to develop a concept that is right for you, flesh out the best way to do it and price it out such that there are no surprises when the job is done. We will also take the finished work and adapt it to a number of applications, from video, to DVD, to webcasting. Our production team has worked together for over 15 years and we know how to make good video. The producer on each project is Ron Taylor, while Mike Visser is the production manager. That means consistency in planning... on-site and in-studio. Over the years we have had a lot of success with our productions and the variety of work we have done means that we can take on whatever you’ve got! TELEPROMPTER SERVICE We have recently started a new service which involves the use of teleprompter technology. What this means is that when you have your spokesperson doing a presentation to the camera, we can have them read the script right off the teleprompter. No more memorizing! The look is totally professional and the message has complete impact. Taylor Creative can offer complete production services for YOUR event! Strength and Soul Yoga - Instructor Kim Wiebe is filmed conducting a full 90 minute yoga class. This DVD is part of a series of videos that were filmed and subsequently distributed and sold through many yoga stores in the Calgary area. Calgary Booster Club - We have produced the Sportsman of the Year Dinner for the past eleven years. 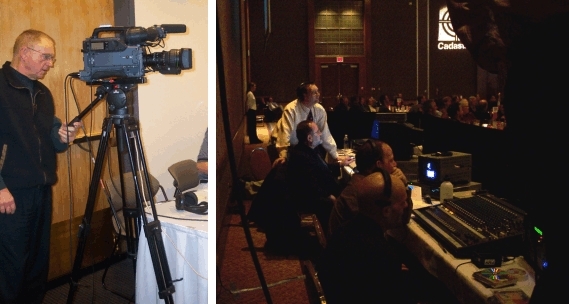 In addition to the approximately 10 pre-packaged clipsthat were inserted into each show, we also utilized a three person camera crew and complete production unit to record proceedings. Calgary Sport Council - Promotional television commercial hosted by Olympian Regan Lauscher and featuring Calgary Mayor Dave Bronconnier. Mayor Dave was featured as a "diver" and the intent was to sell tickets to his Mayor's Sport Breakfast, an event attended by over 500 people. The Inner Golfer - Relaxation, core strength and concentration are key components of golf. They are also what Yoga is all about. Yoga expert, Tracy Mann takes us through a complete 40 minute yoga-golf session. Included are explanations of each exercise. Canadian Petroleum Safety Council - This video is widely used in two provinces and depicts proper hand signals to be used when providing direction in the movement of large machinery. Catriona Le May Doan - A video intro was produced for Catriona that was used as an introduction just prior to her going on stage to do a speaking engagement. The idea was to set the Olympic mood for listeners. Hyatt Auto Group - A series of two productions were created for the Saturn Saab Isuzu dealership. The intent was to highlight the dealership's service department and featured staff members engaging in various forms of customer service. Marble Canyon Condominiums - Investment properties in the Columbia Valley of British Columbia. This video brings viewers on a tour through the luxurious suites and speaks to those who have invested. Script Innovations - The C-Ray Pill Counter is a state of the art machine that counts pharmacists' pills automatically. The most advanced of its kind, it is currently being marketed around the world. BW Technologies - This was a series of four gas detection unit videos which explained how the devices worked. Also used as a sales tool, it is a product that has worldwide distribution, with this video being translated onto several languages. Bust Loose Holidays - A series of videos were produced for Bust Loose Holidays as promotion of their various excursions around the world. This particular one was used as promotion of ski trips to Whitefish, Montana, Jackson Hole, Wyoming and Big White, British Columbia. Calgary Olympic Oval - The Calgary Olympic Oval put in a bid for hosting the World Championships. This video was part of that bid submission, a submission which was successful. Suncor Energy Project Cornerstone - Video production of senior staff members as they inform their staff of the expectations of this new employee development program. Taylor Creative also recorded the 2-day seminar. Suncor Energy Retirement Benefits - We taped two sessions which explained the financial ramifications of the company's retirement package. Following the session, the tape was edited for use internally by Suncor's HR department. Stuart Olson - JOBSITE SAFETY - This presentation explains the various measures taken by Stuart Olson to ensure that safe practices are a vital part of their job sites. Conklin Shows - Canada's Conklin Shpws are a mainstay during the sumnmer fair season. This video traces the history and also delves into the quality and safety of the company. This production was used successfully to secure contracts in the United States. Sport Television Series - "Saskatchewan Sport" was an amateur sport TV series which ran for 5 years on CBC Saskatchewan. It covered all aspects of sport in the province, was nominated for a numberv of ACTRA awards and regularly won its time slot. Bold Heroes - This video was used by coaches as a motivational tool for Saskatchewan athletes competing at the Canada Games. Consisting of flashy music and tightly edited visuals, it's a real attention grabber. Saskatchewan Lotteries - Following the run of "Saskatchewan Sport", Ron Taylor produced 60 TV commercials which featured 60 different amateur sports. The intent of the commercials was to tell a bit about each sport and portray the lotteries as benefitting the development of sport in that province. In addition to producing the spots, Ron also negotiated all of the TV deals with 9 stations around the province to get them opn the air. Provincial High School Athletic Association - "Athletics and Education" was produced for the athletic association to tell of the value of extra-curricular activities in school life. Canadian Parks & Recreation Association - Like with the Booster Club Dinner segments, this project involved producing pre-packaged clips that were shown at the National Volunteer Awards, the feature event of the Canadian Parks and Recreation Association National Conference.